When you buy a new car, the issue of mileage isn’t an issue. It’s more of a problem when the time comes to sell the car on or if you’re in the market for a second-hand car. We all know that the higher mileage, the more likely a vehicle is to break down and give up the ghost, so high-mileage cars tend to be a bit cheaper. However, there are exceptions and some cars just seem to keep going and going. Forbes magazine from the USA recently compiled a list of the cars that were most likely to run for 200,000 miles. Whipping that into metric units, that’s 321,868.8 miles – quite a respectable distance. The article was quick to point out that you need to maintain any car properly to wring a decent number of miles out of it. No car is going to run forever, especially if thrashed. But this article did note that cars in the US seem to be hanging around for a lot longer than they used to. It should be remembered that this is an American magazine, so some of the cars mentioned in its list might not be available over here Down Under, or maybe not the exact same model. It would be interesting to find out the mileages our readers have managed to get out of their cars. Have you ever had a car that was a member of the “200,000 mile club” or, to choose a nice round number using metrics, the 300,000 km club? What was it? 1. Acura RL: This one topped the list but we don’t have it over here… yet. However, it may have been put first because it begins with an A. 2. Ford Fusion: Known as the Ford Mondeo Down Under and in Europe. 3. Ford Mustang: Yes, it’s been around for long enough to see that it can put plenty on the clock. These cars are classics that tend to be well looked after, which explains a lot. According to Forbes magazine, the 3.7 V6 and 5.0 litre V8 variants tend to be the more reliable picks. 5. Honda Fit: This is the American name for it; we call it the Honda Jazz. 6. Lincoln MKZ: Another one not found over here in the average car yard, more’s the pity. 8. Mazda MX-5 Miata: the recommendation here is to go for the manually operated softtop rather than the automatic hardtop version of this hot little convertible. 9. Scion XB: Not found over here, which we can all be grateful for, as it’s ugly as anything. 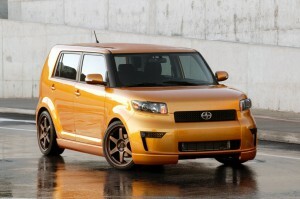 The Scion xB – ugly but likely to be long lasting. Be grateful it hasn’t made it onto Australia’s roads yet. 11. Toyota Highlander: Another one that has a different name over here: the Toyota Kluger in this case. 12. Toyota Sienna: The Tarago’s brother that isn’t over here yet but is pretty popular overseas. 13. Toyota Tundra: there’s noises about people importing this to Australia, but it’s not on Toyota Australia’s official list, so watch this space and keep hoping. General advice for making sure that you can get the most mileage out of your car include buying simpler versions (less to go wrong on them) and making sure that you look after your vehicle properly and drive safely. Oddly enough, the Volvo that has made the Guinness Book of Records for highest mileage isn’t on that list put together by Forbes magazine. Nor were any of the Mercedes-Benz vehicles that have made it into Mercedes’ High Mileage club (for those who have clocked up 250,000 kilometres). As Forbes is a US-based organisation (and had a whole lot of Toyota ads on the site), are we seeing a bit of transatlantic rivalry and a bias against European cars? Hmmmm…. Michelle (not her real name) is a friend of mine who used to be the sort of gal who got about on a Vespa motor scooter when she was a townie but has settled down and married a farmer and gets about in his farm truck. However, that’s about to change, as she’s now pregnant – with twins. Now, you might just be able to get away with fitting one baby seat in the single-cab Toyota Hilux for a few years, but for two, you’re going to need to really re-think your transport options. So here’s some friendly advice for you and for everyone else who’s expecting multiples and is considering upsizing the family car. For a start, don’t even go near a two-door vehicle. Getting two kids into the back seat safely is enough of a palaver with a four-door vehicle, but the job gets next to impossible when you’ve got to reach over from back to front. So you’re going to have to wait quite a few more years until you and your hubby can get that hot little Mazda MX-5. Save that as a reward for a job well done when your twins up sticks and leave home – hard to think of at this stage when they haven’t even been born yet, I know. Secondly, you will have to say goodbye to those little city hatches you like the look, even if they have got four doors and they are very frugal. You are not going to be able to fit the shopping in the back of an old Toyota Starlet as well as the double pushchair you will need. Sure, the tailgate on a hatchback does make things a lot easier when it comes to slinging stuff in the back but you can get these on larger station wagons and on MPVs with the rear seats folded down. Those twins of yours are going to be tiny when they’re born but they’re going to mushroom. They will get long legs and start kicking you in the back while you’re on the long drive into town. If the car’s too small, you will have the choice between being right up close to the dashboard or getting knees/feet in your kidneys. And they will collect friends who will also need transporting as a favour to a friend, or there’s going to be a time when you have Grandma to stay and you will all want to go in the same car. However, I’m going to stick my neck out a little and go against some of the modern trends and I won’t say that a big SUV should be your automatic choice when you’ve got a family on the way. This is because there’ll be several years when the twins will be mobile but won’t be tall enough to see when you’re backing. I don’t want to upset you, Michelle, as I know how much you’ve wanted children, but SUVs and 4x4s are the main culprits when it comes to children being killed in their own homes. And when it comes to overall safety, most modern vehicles are good enough to keep a family safe. (By the way, airbags in the front are a good excuse for keeping both children in the back seat for quite a few years – they can actually cause injury to children when deployed. This will save you a few “It’s not fair! It’s my turn to go in the front! Why can’t I ride in the front seat!” wails, at least until they’re big enough to ride up the front.) However, because you do have a bit of rough stuff to go over with your farm, I won’t say that you should avoid the SUV altogether. You won’t be one of those “suburban tractor” people who never actually use the high ground clearance and all-wheel drive ability of their Porsche Cayenne or whatever they have (stop laughing; I know you’ve got a real tractor!). Or you could go for something a bit lower to the ground (I know you’re driveway’s not that rough) and get an MPV along the lines of a Honda Odyssey. You will still have to be careful when backing but it will be easier to see that unexpected tricycle buzzing around the side of the house in a lower down car. If you do plump for the SUV option, you are going to need to be hyper-vigilant when backing out. Either load both children in the car before the motor even goes on or have a safety step where both children have to stay while cars are going in and out of the driveway – this applies to Dad’s farm ute as well as the family car. You can even, if they get particularly fractious and uncooperative, leave them inside the house with the door shut for a minute while you get the car out. This honestly is safer. Even rear parking sensors and rear cameras have blind spots. Well, the 2013 Guinness Book of Records has recently turned up in the local library and it’s got a page dedicated to record-breaking roads, so here goes with a few of the quirky ones. 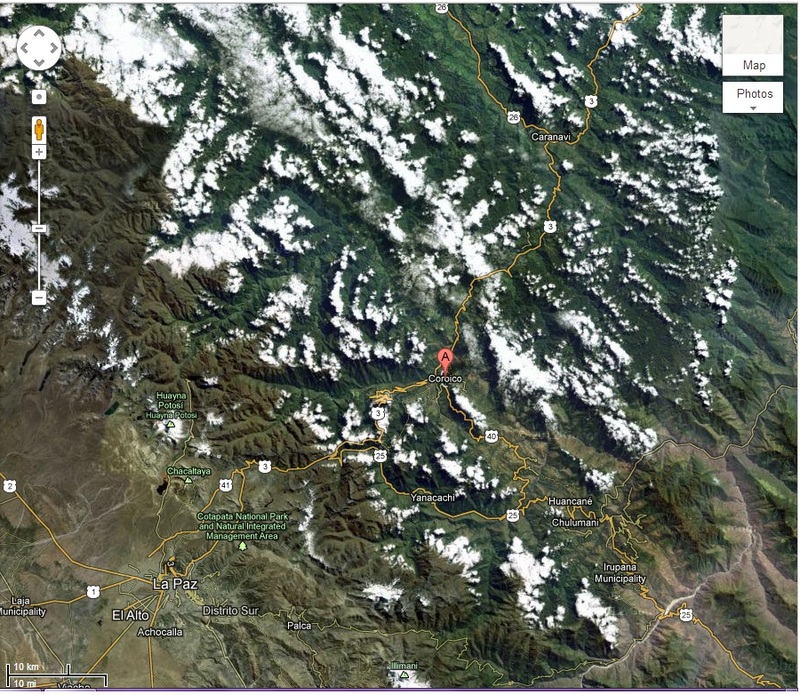 This blog has already touched on and provided a bit of footage of the most dangerous road in the world – the (dis)honour is still held by the North Yungas Road, which runs from La Paz, capital of Bolivia, to Coroico, claiming 300 deaths a year on a 69 km stretch. The road would have been fine back in the Inca empire, as a single-lane dirt road with two-way traffic and a vertical drop of over 4 km straight down and no barricade would have been fine if the only traffic on it was llamas and chasquis (Incan foot couriers – could get fish from the coast to the capital in the Andes within days so it was still fresh at the other end). I’m sure you won’t be surprised to learn that Google Maps doesn’t have this on street view – the survey vehicle isn’t mad enough to drive on it. Most crooked road: Lombard Street in San Francisco, California, USA. 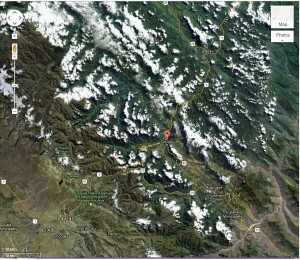 In one 400-m stretch, this road manages to go through eight hairpin turns, meaning that it’s got 1440° of turn. It is said to be popular with skateboarders for this reason. Steepest paved road: Baldwin Street in Dunedin, New Zealand. This road climbs at a rate of 1 m for every 2.86 m horizontally. It’s so steep that the usual tarmac treatment used on roads won’t work because the bitumen runs down before it sets, so it’s paved with concrete with specially designed grooves so cars don’t slip on it, especially as it gets frosty on a regular basis every winter. Beware if you ever want to ride a skateboard, scooter or bike down it, as there’s a fairly busy road intersecting with it at the bottom and stopping without the brakes. Country with the most crowded roads: There are two ways of measuring this. If you mean the road network with the highest amount of kilometres driven by all road users put together (vehicle-kilometres travelled or vkt) per km of road network, the title goes to Hong Kong, where for every km of road, drivers cover over 5 million vkt. However, if you measure congestion by the number of vehicles in the country per km of road network, the title goes to Kuwait, with 271 vehicles for every km of road (however, it’s unlikely that every car in Kuwait is out on the road at once, so the country doesn’t sit there bumper to bumper all day chewing through its own oil reserves). Longest one-way street: The M2 Southern Expressway in Adelaide gets the prize here. Readers in Adelaide will be familiar with how this stretch is open to northbound traffic into the city in the morning rush hour and swaps it around so they can all go home again in the afternoon. This makes it count as a one-way street, so at 21 km long, it can claim the title. Longest continuous road: Another Australian title and one you might well have driven on yourself, at least partly. Highway One manages to get completely around the country without any breaks (traffic lights don’t count), covering 14,523 km from your starting point until you get back to the beginning again. This beats the Trans-Siberian Highway in Russia by 3500 km. Most complicated roundabout: In Swindon in the UK, you can find the Magic Roundabout. This has five roundabouts that lead into a larger roundabout – and the larger roundabout is two-way, meaning that you can go around it anticlockwise or clockwise. This roundabout also has a number of non-Guinness records, including being in the top ten of the Scariest Junctions in the UK and the Worst UK Intersection according to an insurance company survey. Most complicated other sort of junction: This one goes to the Judge Harry Pregerson Interchange in Los Angeles, California, USA. It’s one of those multi-level intersections where one road goes over another, but here there four levels, each with entry and exit lanes among them and a couple of high-occupancy lanes into the bargain. No wonder it’s named after someone in the legal profession. Oldest road still in use: The Via Appia in Italy running between Rome and Brindisi has been in use since 312 BC. In places, you can still see and travel on the original Roman paving (which makes the durability of modern roads look pathetic – are they going to be able to last 2324 years?). Highest mileage clocked up by a single car: Of course, if there are record breaking roads, there should be record-breaking cars to run on them. The car that has put the most miles on the clock is a 1966 P-1800S Volvo, and it’s managed to do 4,667,097 km (2.9 million miles). It’s a funny thing about Car of the Year (COTY) awards. Everyone’s agog to hear what this year’s winner is going to be, and car manufacturers are usually very proud to scoop the title. However, who actually remembers the winners of four or five years ago? You probably only remember if a particular vehicle was a winner if (a) you bought it or owned a new one about the time that the car got the award, or (b) you’re a car enthusiast with a taste for lists, facts and figures. What makes things even more confusing is that there seem to be umpteen COTY titles. In Australia, we’ve got the Wheels Magazine COTY award, which has been running for ages but isn’t viewed by purists as a “real” COTY award for some reason or other, probably to do with how this award only gives out the grand prize to new releases rather than older makes that have undergone some serious overhauling and tweaking. And you’ve got other COTY awards that have multiple categories rather than one big overall COTY prize, on the grounds that you should compare Granny Smiths with Braeburns and Galas rather than apples with peaches. Then you’ve got COTY awards for nearly every country in the world. However, the COTY award with the most clout seems to be the European one, which draws its judging panels from eight EU nations, most of which are notable car-manufacturing countries (or were before the trend for outsourcing things and big buyouts). At the moment, the European COTY judging is going on, and 35 vehicles are on the first list. We’ve got about a month to wait until the shortlist comes out, but it’s good to see a real mix of vehicles on this list, most of which you can get over here in Australia. Interestingly, this list counts two cars that are basically the same but have different badges and names as one car – e.g. Subaru BRZ and Toyota GT86. What do you reckon about SUVs and their bullishness on our roads? The deliberation about SUVs, let alone trucks, being too big and potentially dangerous on the roads has been around for some time now. Summing up the argument against the SUVs, Keith Bradshaw, in his book ‘High and Mighty’, fires a number of assertive shots that, to be fair, are right on the money. We’ll never get rid of the SUVs and 4x4s from our roads; they’re just too practical. But big vehicles like the Nissan Patrol, Toyota Land Cruiser and Holden Colorado do leave some serious carnage out on the road when they just-so happen to be in the wrong place at the wrong time. A lot of people love the ride height, the space, the practicality, the off-roading ability and the comfort of many SUV models. A flash new Rangie or X5 is always going to be a great status symbol, looking great up anyone’s driveway. But behind the rosy appeal of an SUV creeps one or two nasty stats that are hard to hide. To see this nastiness we look into some of the grim findings that crash statistics reveal, something which Keith has been harping on about for so long. Nasty, big accidents are always best avoided. When it all comes down to it, car crashes are all about physics. The forces at work, the weights, the speeds and breaking points of stressed metal during a car crash all work together to produce the final mess. Just how big that mess will be depends on the sizes of the vehicles involved. Unfortunately, for the driver of the smaller vehicle, their vehicle acts as an enlarged crumple zone when it collides with a weightier, more solidly built SUV. It might seem nice for you to think that because you are the one in the SUV you’ll be better protected than the person in the Corolla. However, some would say that this sort of thinking is more than a little inconsiderate towards the driver of the Corolla – who may or may not walk away. With more and more people buying SUVs, there is an increase in SUVs on our roads – making it a little riskier for those driving smaller vehicles. But now we’re going to take a look at the SUV crash stats from a different angle. Occupants of SUVs do fair better in front on accidents with smaller vehicles. They also fair very well when they are hit side-on by smaller vehicles. Their greater height and stronger chassis components overwhelm the smaller vehicles. But the positives for the SUV driver stops here. Research collected from everyday crashes involving SUVs shows a higher percentage of people die in serious SUV crashes than in serious car crashes. Now how can this be? Because of the weight and strength of the SUV and 4×4, if they crash into any immovable solid object, like a brick wall or large tree, then the stiffer structure of the vehicle transfers a huge part of the crash forces into its occupants. The human frame can’t cope with such high loads. Rollovers happen at a higher rate in SUV type vehicles than in cars. A higher centre of gravity means that they are more likely to roll when they lose control. High speed rollovers are particularly lethal in a big SUV. Occupants are flung towards the outsides of the vehicle, and the impact with solid materials is often fatal. Roofs of an everyday SUV, more often than not, aren’t strong enough to resist caving in during a high speed rollover. Very new SUVs like the BMW X6 have side curtain airbags as well as airbags that come from the roof lining by the doors. They also have pre-tensioned seatbelts and a stronger safety cage. These new features are not found in your everyday SUV of yesteryear. So the moral? Buy an SUV if you want to; always wear your pre-tensioned seatbelts, and drive safely!